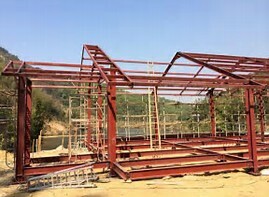 SBS Steel Structure F. Friction surface processing 1) The high strength bolts are connected with the friction surface, and the sanding, shot blasting and grinding of the grinding machine can be used. (Note: The grinding wheel grinding direction should be perpendicular to the force direction of the component and the grinding range shall not be less than 4 times of the bolt diameter. 2) The treated friction surface should take anti-oil and damage protection measures. 3) The manufacturer and the installation unit shall carry out the anti-slip coefficient test respectively with the steel structure manufacturing lot. The production batch may be divided into quantities according to the division of the sub-section (sub-part) of the project, and less than 2,000 tons can be regarded as a batch. When two or more surface treatment processes are selected, each treatment process shall be tested separately and each batch of three sets of test pieces. 4) Anti-slip coefficient test specimens should be processed by the manufacturer, the specimen and the representative of the steel structure should be the same material, the same batch production, using the same friction surface treatment process and have the same surface state, and application With the same grade of high strength bolts connected to the same level, stored in the same environmental conditions. 5) The thickness of the specimen steel plate shall be determined according to the thickness of the plate in the steel structure. Specimen board surface should be flat, no oil, holes and the edge of the board without flash, burr. 6) The manufacturer shall carry out the anti-slip coefficient test at the same time as the steel structure is manufactured and report it. The test report shall state the test method and results. 7) It should be based on the existing national standard "steel structure of high strength bolting connection design, construction and acceptance procedures" JGJ82 requirements or design documents, the production of materials and treatment methods of the same re-test anti-slip coefficient with the components and The components are handed over at the same time. G. tube ball processing 1) bar production process: the procurement of steel pipe → inspection material, specifications, surface quality (anti-corrosion treatment) → cutting, opening groove → with the cone or sealing plate assembly point welding → welding → inspection → anticorrosion treatment → anti-corrosion treatment. 2) Bolt ball manufacturing process: steel bar for pressure processing (or ingot) or machining of round bar → forging blank → normalizing treatment → processing positioning screw hole (M20) and its surface → processing of the threaded hole and plane → Processing number, playing the number → anti-corrosion treatment → anti-corrosion treatment. 3) cone, sealing plate production process: finished steel material → tire forging rough → normalizing treatment → mechanical processing. 4) welding ball node grid manufacturing process: procurement of steel pipe → test material, specifications, surface quality → lofting → cutting → hollow ball production → assembly → anti-corrosion treatment. 5) welding hollow ball production process: cutting (with profiling knife) → pressing (heating) molding → machine or automatic gas groove → welding → weld non-destructive testing → corrosion treatment → packaging.